Sabah Jassim has a BSc and an MSc from Baghdad University and a PhD in Mathematics from the University of Wales. He is Professor of Mathematics. 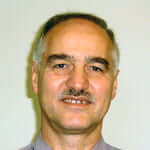 He is also a visiting lecturer at City University, London, and Fachhochschule Wedel, Germany. He is Professor of Mathematics and Computation and teaches various courses at undergraduate and postgraduate level. These include Image Processing, Mathematics and Algorithms. He also supervises research students in the areas of Biometrics – Authentication, Biomedical Image Analysis and Dynamic Encryption. A. A. A. Alazeez, S. Jassim and H. Du, "SLDPC: Towards Second Order Learning for Detecting Persistent Clusters in Data Streams," 2018 10th Computer Science and Electronic Engineering (CEEC), Colchester, United Kingdom, 2018, pp. 248-253. S.A. Jassim, “Face recognition from degraded images"
N. Al-Jawad & S. Jassim, "Wavelet Based Image Quality Self Measurements"
H. Sellahewa & S.A. Jassim, "Image-quality-based adaptive face recognition"
Harin Sellahewa & Sabah Jassim, "Image quality-based adaptive illumination normalisation for face recognition"
Fanzhi Li, Ali Al-Sherbaz, Chris Adams & Sabah Jassim, "Credibility based secure route finding in wireless ad hoc networks"
Ali Al-Sherbaz, Chris Adams & Sabah Jassim, "Private synchronization technique for heterogeneous wireless network (WiFi and WiMAX)"
Sabah Jassim et al., "The Securephone: a mobile phone with biometric authentication and e-signature support for dealing secure transactions on the fly"
Naseer Al-Jawad, Sabah Jassim et al., "An efficient real-time video compression algorithm with high feature preserving capability"
Sabah Jassim et al., "Filters ranking for DWT-domain robust digital watermarking"
Sabah Jassim, Chris Adams et al., "A non-uniform wavelet-based video/image compression technique"
Sabah Jassim et al., "The choice of filter banks for wavelet-based robust digital watermarking"